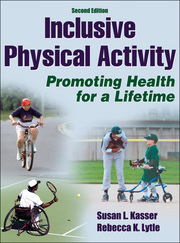 facilitate physical activity to increase health and and wellness for individuals with disabilities. Inclusive Physical Activity outlines a systematic approach to planning and implementing appropriate programs for individuals of varying abilities. Using the unique Functional Approach to Modifying Movement Experiences (FAMME) model, practitioners can learn—step by step—how to connect modifications directly to participants’ capability differences to provide optimal challenge and success. Instructors who adopt the text get online access to an instructor guide, test package, and presentation package. New to the second edition, the presentation package offers approximately 150 slides highlighting the most important concepts from the book plus essential figures, tables, and photos. With Inclusive Physical Activity, both students and professionals will find the knowledge and support to make meaningful and inclusive physical activity a reality and promote better health for everyone. An introductory methods textbook for undergraduates studying physical education, adapted physical education, exercise science, therapuetic recreation, and other disciplines in education, fitness, and recreation. Susan L. Kasser, PhD, is an associate professor in the department of rehabilitation and movement science at the University of Vermont at Burlington, where she teaches courses pertaining to inclusive physical activity. She holds a doctorate in movement studies in disability from Oregon State University. Kasser has over 20 years of teaching experience in community and school-based physical activity programs involving individuals with diverse abilities. She has presented on both national and international levels in the area of inclusive physical activity. Kasser has also developed many community-based exercise programs for adults with chronic conditions and disabilities, including the Individualized Exercise for Active Lifestyles (IDEAL) program, which has served more than 75 adults with multiple sclerosis since 1998. In 2012 she received the Outstanding Faculty Award from the College of Nursing and Health Sciences at the University of Vermont. Kasser also received the 2001 Outstanding Educator Award from the Vermont Association for Health, Physical Education, Recreation and Dance and the 2000 Kroepsch-Maurice Excellence in Teaching Award from the University of Vermont. Kasser resides in Jericho, Vermont, where she enjoys hiking, kayaking, and backpacking in her free time. Rebecca K. Lytle, PhD, is a professor in the department of kinesiology at California State University at Chico, where she teaches courses in adapted physical education and motor development. Lytle has been teaching in higher education since 1992. She also taught as an adapted physical education teacher in the public schools from 1988-1996, and was a school consultant from 2000-2002. Lytle has published numerous articles for refereed journals and coauthored three books and six book chapters on adapted physical activity. She has presented at the state, national, and international levels and has served as consultant or coordinator for several community-based physical activity and motor skill assessment programs for both children and adults. She is a member of the International Council for Health, Physical Education, Recreation, Sport and Dance (ICHPER-SD); Council for Exceptional Children (CEC); International Federation of Adapted Physical Activity (IFAPA); National Consortium for Physical Education and Recreation for Individuals with Disabilities (NCPERID); Adapted Physical Activity Council (APAC); Northern California Adapted Physical Education Consortium (NCAPEC); American Alliance for Health, Physical Education, Recreation and Dance (AAHPERD); California Association for Health, Physical Education, Recreation and Dance (CAHPERD); and California Teachers Association (CTA). Lytle also serves as chair of the National Adapted Physical Activity Council of AAHPERD and chair of the California State Council on Adapted Physical Education. Lytle and her husband, Donald, reside in Chico. In her free time she enjoys playing with children, walking and hiking, and playing baseball and softball. All ancillary materials for this text are FREE to course adopters and available online at www.HumanKinetics.com/InclusivePhysicalActivity. Instructor guide. Includes chapter overviews, a sample syllabus, and class activities. Test package. Includes over 150 test questions of multiple choice, true-and-false, and matching questions that you can use to create your own tests and quizzes.